Trundles & Bed Bases | Wrought Iron & Brass Bed Co. Although a slatted base comes standard with all our beds, you may wish to upgrade. Whether it be an un-sprung bed base or a sprung bed base, the upgrade can not only improve your quality of sleep but also the quality of the bed overall. If you have any questions about adding on a bed base, please feel free to give us a call on 01485 542516 and we can guide you through the world of bed bases. Bed bases are designed for two reasons, one being the aesthetic, but the more important reason being that they help maintain and protect your mattresses comfort and support for longer! If you are thinking of adding a base onto your bed, your mattress height will be raised and this could look odd on some designs. 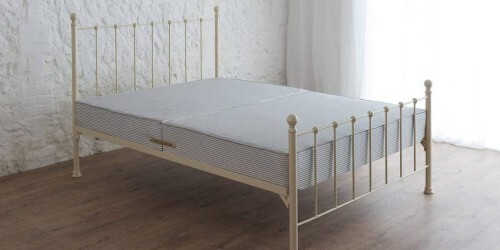 However, worry not because here at Wrought Iron & Brass Bed co all of our beds are handcrafted, meaning we can alter the height of the side rails to compensate for this. This means your bed looks perfect whatever height of mattress you go for. Take a look at our various styles of mattresses including the very popular pocket sprung mattress and our open coil mattress, they’re both designed to give you ultimate levels of comfort.